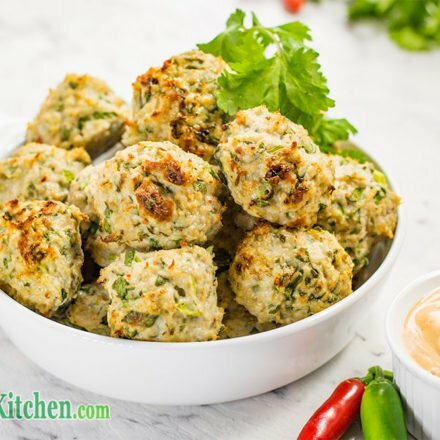 Tantalizing Thai Treats, our Keto Thai Chicken Meatballs with Low-Carb Dipping Sauce are a great meal, snack or finger food. The keto chicken meatballs are best served hot but have been enjoyed cold, added to a salad with equally delicious results. 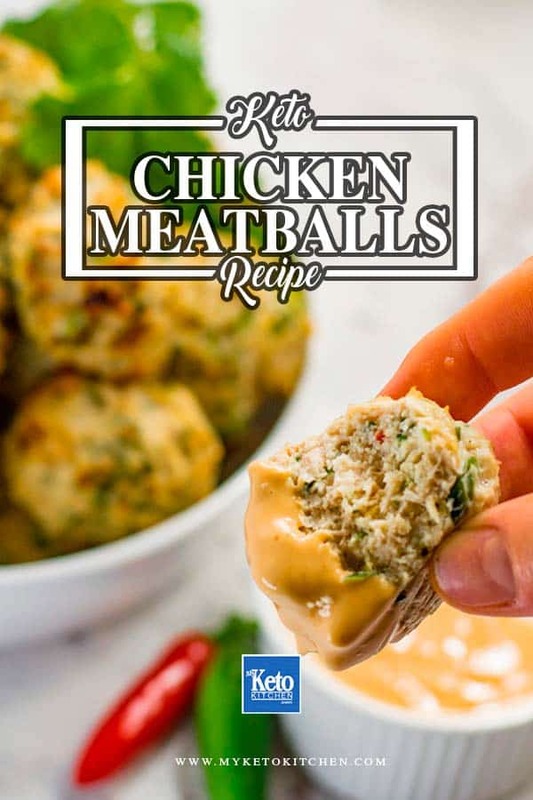 Keto Thai chicken meatballs can be kept up to 1 week in the fridge or frozen for up to 3 months. This Thai meatballs recipe makes 8 serves. If you have chosen to mix the meatballs with your hands (without gloves) be sure to wash them thoroughly afterward as the chili can irritate sensitive skin and will burn horribly if you accidentally rub your eyes. Love our low-carb Thai chicken meatballs? We’ve got plenty of great ideas, from our Chicken & Feta Meatballs to our Chicken, Cheddar & Chive Meatballs and our Lamb & Haloumi Burgers are easily modified. In a large mixing bowl add all the “thai chicken meatballs” ingredients. Using your hands, mix all ingredients well. We recommend wearing a pair of food safe gloves to complete this step. Roll the mixture into balls approximately the size of 2 tablespoons. We made 20 meatballs from the mixture. Place the balls onto a lined cookie sheet and place into the oven. Bake for 15-20 minutes, until the meatballs have browned and are firm to the touch. If you are unsure, cut one in half to check that the meatball is cooked through. Add all “dipping sauce” ingredients into a mixing bowl and whisk together until combined. Serve dipping sauce with the cooked meatballs and enjoy. If you want to make a larger batch of Low Carb Thai Chicken Meatballs, or of the Dipping Sauce, simply adjust the serving amounts in our easy to use recipe card below. 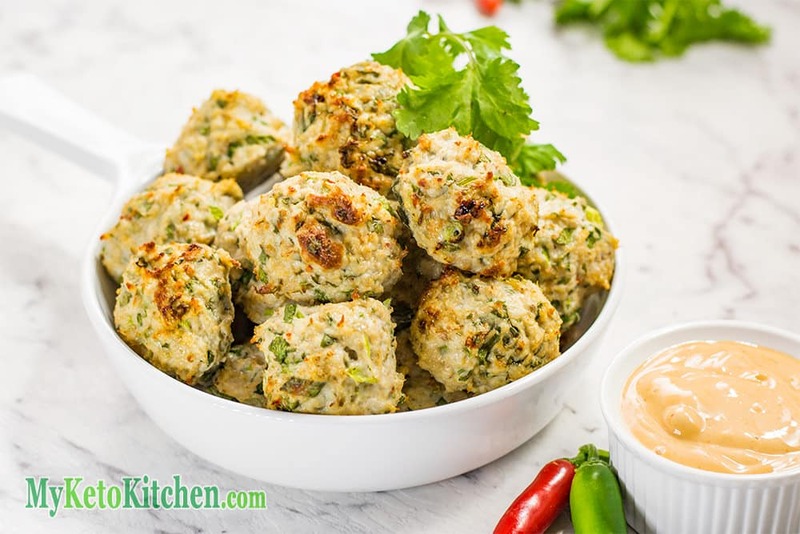 Tantalizing Thai Treats, our Low Carb Thai Chicken Meatballs with Dipping Sauce are a great meal, snack or finger food. So essentially 1 serving is 2 meatballs correct? Two and a half large meatballs and a portion of the dipping sauce is 1 serving. I made this tonight and both my hb and I loved it! It’s really savory and I plan on making it regularly. Unfortunately I didn’t have time to make the mayo but it was moist enough. A great recipe, thank you!